Transportation Unlimited: This 1949 Chevrolet Film Highlights An Incredible Array Of 1930s and 40s Chevy Heavy Duty Trucks! If there is one thing that we know about old trucks, especially those of the heavy duty variety it is that they do not live the long lives that many old cars do. They are machines designed to be used for working purposes every day and they are purchased with the idea that they’ll eventually make the owner money, not cost them money. In order to get the math right, that truck needs to be rolling every day and because of that these beasts of burden got worked to death, scrapped, and replaced for the most part. Not to say that there are not a lot of awesome old trucks out there but there are more muscle cars that old working rigs, right? 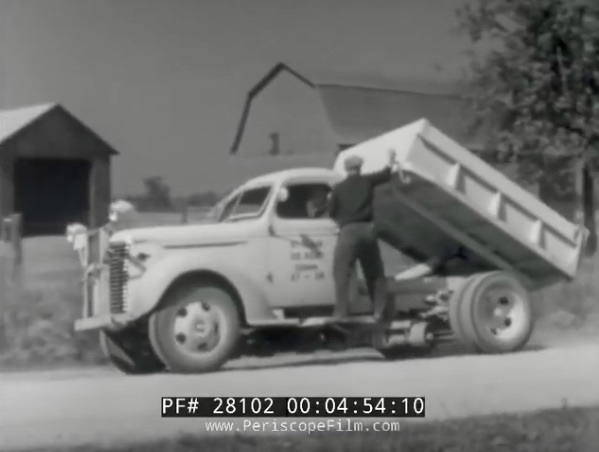 The reason we fell in love with this film is because we not only see old trucks but we see some 50 different versions of Chevy heavy duty trucks working in the 1940s. These rigs range in age from the 1930s all the way into the late 40’s at the time of filming. From building roads to hauling cotton, concrete, and whatever else you can imagine you’ll watch trucks handle the business of America as the announcer cheerily tells us all about it. We always see COE trucks today as cruiser and hot rods, well this is your chance to see them as they were originally intended to be seen. Delivering coal, lumber, and other stuff. There are school buses with a seating arrangement that will boggle your mind, weird trolley looking city buses from the 1940s, and plenty of scenes showing various American industries that will make you smile. In short, this video rules if you love trucks…and we do. Car Show Photo Coverage: 2019 Summit Racing Equipment Piston Powered Expo - This Show Rules! How To Make $101,000 In A Day: Every Radial vs The World Elimination Run From The DuckX Sweet 16 2.0! Automotive industry now develop day by day. It upgraded with technology features which is make easy work in automotive industry. They are machines designed to be used for working purposes every day and they are purchased with the new idea that they’ll eventually make the owner money, not cost them money.